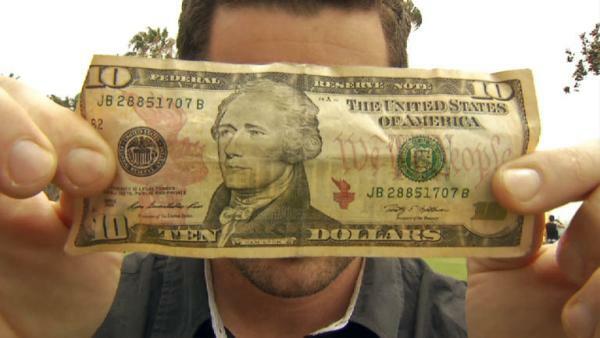 Ryan Scott is on a mission to find delicious dishes under $10 budget in LA. He stops at different locations, including a taco stand that was a shoe shine shack. What can you get for under $10 in Los Angeles? Maybe you're thinking Chef Ryan Scott must be eating fast food today, but that's not how he rolls. "I know some cheap eats where you can get the best value for your buck," he says. First, Ryan stops at Dino's where he can get a half a chicken, hand-cut french fries, coleslaw and tortialls, all for $6.53. Dimitrious Pantazis, owner of Dino's, takes Ryan back to the kitchen to show him how they make their delicious birds. The chickens are pre-cooked, marinated and then grilled to perfection. The secret is in the marinade, but Dino says he won't give up the recipe. After Dino shows him how they put the chicken on the grill, it's finally time for him to sit down and eat. The juicy delicious chicken is great, and he still has change left over. "It's juicy. It's sweet. It's cooked perfectly," says Ryan. Next up, Ryan meets with Margi Herrera of Yuca's Homemade Tacos and Burritos in the Los Feliz neighborhood. Margi's mom started the restaurant 37 years ago in a tiny building that used to be a shoe shine stand. "This is quite possibly the smallest restaurant I've ever seen," says Ryan. Margi recommends Ryan try the carne asada and cochinita pibil, a slow-roasted mexican pork dish -- which are her customers' favorite dishes. Ryan meets up with Margi's sister, Dora, who shows him how they cook their famous dishes. After learning the secrets, Ryan tries the dishes. "Love, love, love," says Ryan. After Yuca's, Ryan heads over to Los Angeles' Little Tokyo neighborhood where he tries to see how much Japanese food he can get for under $10. At Shin-Sen-Gumi, he meets with Sami Kato, who tells him he should try their house specialty, the Hakata Ramen, named for the Hakata region of Japan. Since the basic ramen is just $6.95, Ryan adds some spicy miso and egg. Back in the kitchen, chef Shigeru Shinohara shows Ryan how to make ramen, adding some pickled ginger and scallions to the top. "Man, oh man," says Ryan. "Pork deliciousness. If you don't like pork, you may be converted on this one." Ryan has one more place to visit, right on Hollywood Boulevard, Skooby's Hot Dogs. Owner John Hooper says Ryan has definitely come to the right place if he wants a full meal under $10. "We're going to fill you up, and you're still going to have change left over," says John. For $7.50, Ryan gets a hot dog, hand cut fries and Skooby's homemade lemonade. For another two dollars, Ryan adds grilled onions, bacon and cheese as well. The restaurant's hot dogs are all beef and made by a local family in LA. John shows Ryan how they make their amazing hand-cut fries. Skooby's cuts their fries in both chips and strips to please their customers. While the fries fry in oil, they work on the hot dog. For bread, Skooby's uses King's Hawaiian rolls instead of regular buns. "This bread is a little bit sweet and we think it brings out the flavor of our hot dog really really well," says John. Every order of fries comes with a dipping sauce, a garlic and roasted red pepper aioli that's special to Skooby's. The meal is delicious and 50 cents under budget. Learn how to make a grilled chicken dish bursting with delicious flavor. It's all about the marinade! The secret to these amazing burritos is the skirt steak. Slow-cooked shredded pork makes these tacos delicious. Go inside a Japanese noodle house in LA's Little Tokyo with Ryan Scott. What's the secret to making amazing ramen? Find out with this tasty recipe. This delicious sauce is served with fries and all-beef hot dogs.